The Daiwa Exceler-HA is no longer available. To find a comparable reel, please use the menu to the left. "I had been wanting to upgrade my arsenal of fishing tools to the next level for a long time, but it's hard to justify shelling out $300+ dollars on just one reel. So, I began researching every reel on the market." "To start off this is the best reel I have ever bought. I started of with a shimano stella sw, I tested it out I thought it was ok but not the best. I was going to test it agianst the saltiga but me and my pal were out fishing last week and he had the certate. " "I bought the Daiwa Certate 2500 spinning reel and love it!!! It is an amazing spinning reel - definitely the best I've ever used. Why the Certate and not the Steez? Well, save your $100.00 and buy good line and some lures, and you can actually use the Certate in saltwater. " "I have six fishing reels and rods. By far this reel is my favorite. I use it for salt water fishing. I have it on a G-loomis Greenwater rod. 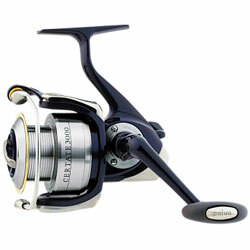 It is very light and it is the smoothest reel I have ever used or owned."